The Day of the Djinn Warriors - Audiobook | Listen Instantly! Djinn twins John and Philippa are off on another whirlwind adventure that takes them around the globe and into unknown worlds. Download and start listening now!
" Great addition to the series, but it so obviously ended at a cliffhanger moment that ultimately will result in a future book... "
" THE Djinn twins go on another wonderful adventure. " " oh yeah! i can't believe these books can keep going and just as good as the one before. " " Good fantasy adventure. Great story with Biblical allusions, historical references, and plenty of imagination. " " There were some typo's in this book. Sometimes I wonder where the editor was. Like the last book there some plot inconsistancies that were kind of annoying. I think it was just not planning ahead and then coming up with an idea and trying to make things work around it. The ending was a little weird with Mrs. Trump and Mrs. Gaunt. " " Another good one in the series, although I thought this one jumped around a lot and had too many sub-plots going on at the same time. And the ending... look for the next book is all I can say as this one just kind of quit after one sentence..... "
" it is definatly exciting. " " This series continues to be just outstanding. One of the best things about it is getting to be an armchair traveler in some really fascinating & exotic places as diverse as Xian, China, & a small island off the coast of Scotland, all in one book. " " the ghost are disappearing and the ifriti are up to something, the twins have to solve "
" I've read book 1-4 so far on these also. They are a quick read. A little more simplistic than some of the kids books but still give you a good story that is engaging to follow. " " I'm becoming a fan of this series. It's not overly ambitious or showy. It's just a solid, good story about two fine heroes. " " i am reading this now. so far i am luving it all the way "
" I really enjoy reading the 'Children of the Lamp' series. Everytime 3/4 stories run in parallel and the culmination is reached at the end. The adventure and action is refreshing always. " " New York Djinn versus Chinese Djinn mixed with a bit of Halloween children hypnotic antics. Yep a pretty good book. " " i would only recomend ths book to people who were looking for an okay book.I didn't really enjoy this book because TO ME it wasn't all that interesting.But thats just MY LOOK ON THE BOOK,my cousin really injoyed it a is reading it for the 3rd time in a row. " " theres a stinkin 'nother one?????? These are good books, but they just keep goin on and on. " " How to read this "
" Fourth book in the children of the lamp series. I enjoyed reading it. Quite exciting and compelling, though not a book with a lot a hidden messages. Very plot driven. Good for younger readers, especially boys. " " this is a reallly great book! " " I love this series!! Anyway my fave part here is when the twins and Nimrod try to save the children... Why did Rakshasas and Buck have to die and lose their powers (respectively) ? " " Groanin, I love you. :) "
" A good continuation to the series. I loved the Chinese portions of the novel. A quick simple read, but good. " " Enjoyed this book, as will my son. We're reading the series together. I was dissapointed in the copy I had, however, as it was put together incorrectly. A group of 60 or so pages was missing near the last third of the book, and replaced with pages from an earlier section. Yuck! " " Giving up on the series. Disgusted by the exploitation of children in a children's book as well as the graphic punishment of the villain at the end of the book. " " I really think these fantasy books are a fun read. This is the fourth in the series. Sometimes so much is going on that it is hard to follow, but it's always amusing. Kerr is quirky and humorous and I've enjoyed this story set in the modern day written from the point of view of twin teenage djinn. " " This book is really good. The author makes great connections to characters introduced in the first and second book and she does a good job of tying up some loose ends in the series. " " this was an interesting and captivating book in this series. it shows you about a lot of evil and cruelty, but also about friendship and caring. this book also displays responsibility and love. not to forget the wisdom and brains that are included. " " This book was quick reading and humorous. I think that pre-teens might not catch all of the humor. My teen is finishing this series and still enjoys it. " " excellent especially after viewing the Terracotta Warriors and the Qin Dynasty exhibit at the ROM, Ontario. Makes you go hmmm? Was Genghis Khan really a djinn? " " Enjoyable as are all the Children of the Lamp books. " " This one is so interesting and plot twisting. I love these books! Phil is such a logical character. John is so fun and loving. Dybbuk is so mysterious. And Faustina.... I don't really like her character, but I do like her. It's weird. We have a touchy relationship. " 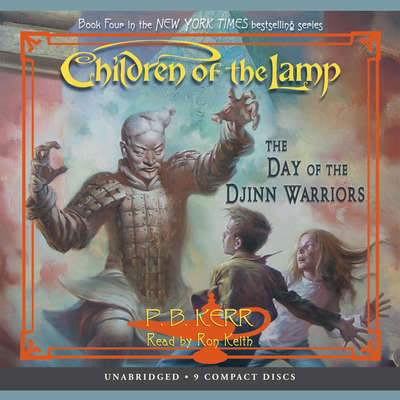 " The children of the Lamp series is my favorite book series of all time. I have been reading them since I was about twelve, and I still buy them the first of January every year, the day they come out. " " it wasd awsome it is my 2nd fav "
P. B. Kerr was born in Edinburgh, Scotland, where he developed a lifelong love of reading. Although the Children of the Lamp books are P. B. Kerr’s first for children, he’s well known as the thriller writer Philip Kerr, author of the Berlin Noir series. Mr. Kerr lives in London with his family.